Hog Hunting at Hunt F E Hill is made up of 11,700 acres of Trinity River Bottom mixed with beautiful rolling hillsides and it is all available for daytime Hog Hunting or nighttime Thermal Hog Hunts. 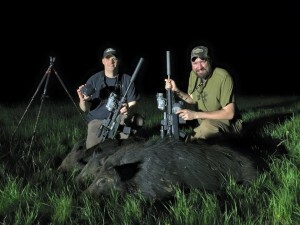 Two options for hog hunting are, still hunting our blinds over corn feeders and Thermal & night vision hog hunts. We’ve been hog hunting from as far back as I can remember and over the last 30 years we incorporated a hunting program at our ranch by offering lease opportunities with very high success rates as far back as we can remember. 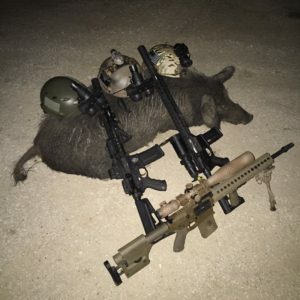 There are NO seasons for feral hogs in Texas but hunters must obtain a legal Texas hunting license to participate in Hog Hunts. 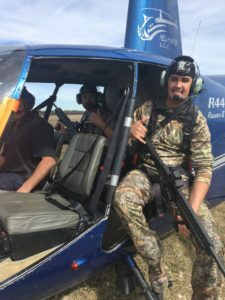 We recommend comfortable clothing and snake proof boots if hog hunting in the spring or summer months and warm and waterproof clothing and boots for hog hunting fall or winter months. Day time hog hunts are very comparable to deer and duck hunts. Still hunting is much of what we recommend but other options are available if requested during the time of your reservation. If your group wants to run hogs with bay and catch dogs, then you’ll need to call for pricing. If it is a hunting blind style hunt then continental breakfast and brunch will be served after the morning hunt. Thermal / Night vision hunts are all-inclusive and there will be an evening meal provided prior to the hunt, then 6 guaranteed hours of hunting. After the hunt, which usually ends around 2-3 am, the hunter is free to leave or stay at camp until ready to leave the next morning. There are no limits or permits necessary to hunt hog in Texas, however, a valid hunting license is required and can be purchased online. If caping a trophy for taxidermy prep is requested there will be an additional fee paid to your guide of $50/hog. We also can provide taxidermy information upon request. 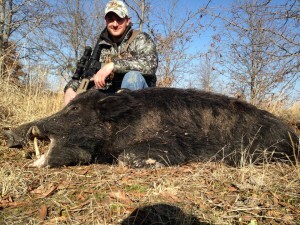 Contact us for seasonal rates or discounts on all of our hog hunting opportunities. All hog hunters will be responsible for getting themselves to and from camp. Closest airport is DFW or Dallas Love Field. Contact us for directions. Ranked as one of the Top Texas Trophy Hog Hunting Destinations in 2016 by Ranch Review and Outfitter Connection!